A new research note from Wells Fargo covering Amazon (AMZN) and the world of retail has put forth several head-reeling statistics. In 2018, the number of unique visitors to Amazon represents 74% of all internet users in the U.S. The Seattle retail giant “is not having difficulty finding new customers even as their user base grows to remarkably high levels,” the note said. From a survey of 1,500 people in the U.S. — of which 93% were Amazon users — Wells Fargo analysts found that visit frequency is also up 6%. This has helped Amazon’s “wallet share” — the amount of a consumer’s budget allocated to Amazon purchases — to spike to 33% from 27%. “We think it is remarkable that Amazon isn’t well-known as a soft goods destination, but they have now grown to become the industry leader,” the analysts wrote. And it’s not slowing down. 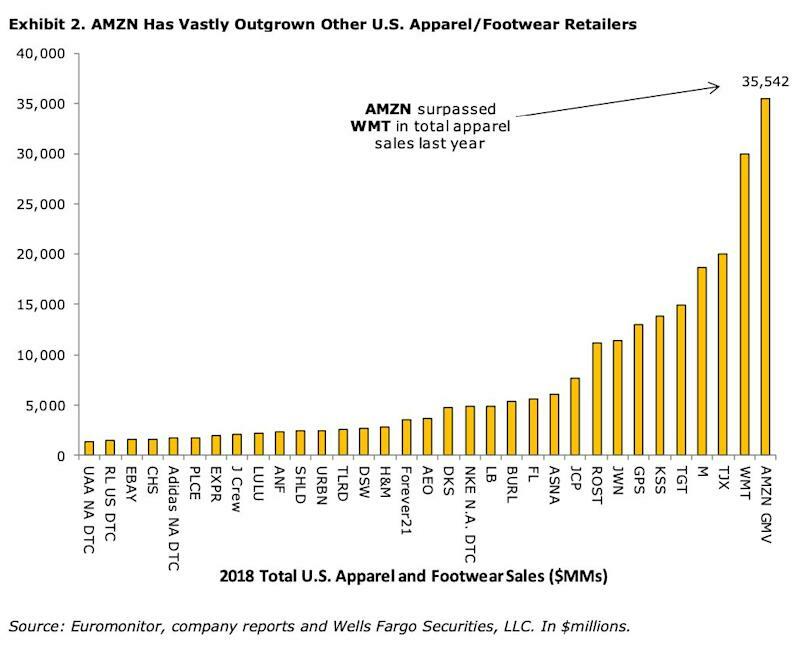 Next year, these numbers will surge even more, putting Amazon’s position at 12.1% of the total apparel and footwear market, and 46.1% if just counting online retail. 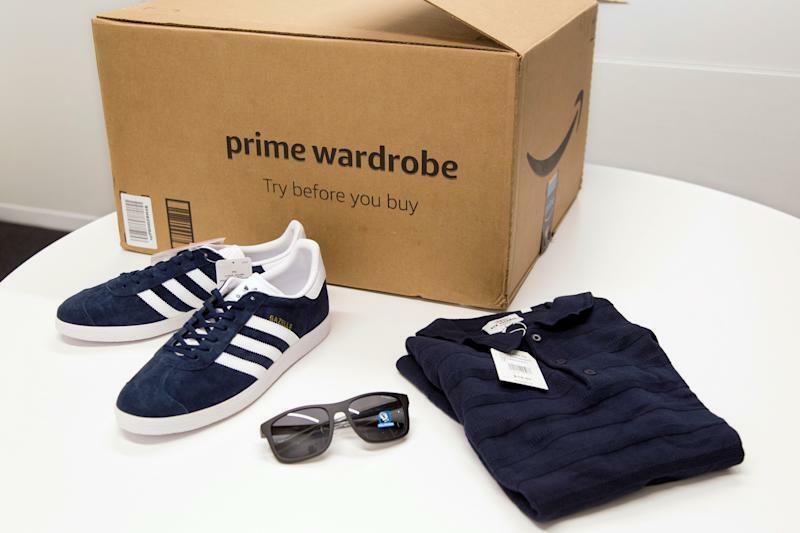 And the gulf between Amazon and its closest competitor in the apparel space is widening: Its sales are now five times the size of the number two company, Macy’s, in footwear and apparel sales. Every other retailer besides Macy’s is under $3.5 billion while Amazon does $35 billion per year. Any report on ecommerce needs to be put into perspective with the overall retail economy, which is much larger as stores are far from obsolete. While Amazon dominates the online space, which has doubled in the past five years, ecommerce is still under 10% of total retail sales, Wells Fargo said. If you measure this number with what’s called “total addressable market,” which excludes stuff that’s less popular to buy online — like gas, grocery, cars, pharma — ecommerce jumps to about 20% of total retail. So what do these numbers mean for other retailers, not run by Jeff Bezos? The analysts’ key takeaway is that it doesn’t look very good. In the recent past, Amazon accounted for around 30% to 35% of the space in which it competes – that “total addressable market” figure. Now, Amazon accounts for almost 50% of ecommerce growth. 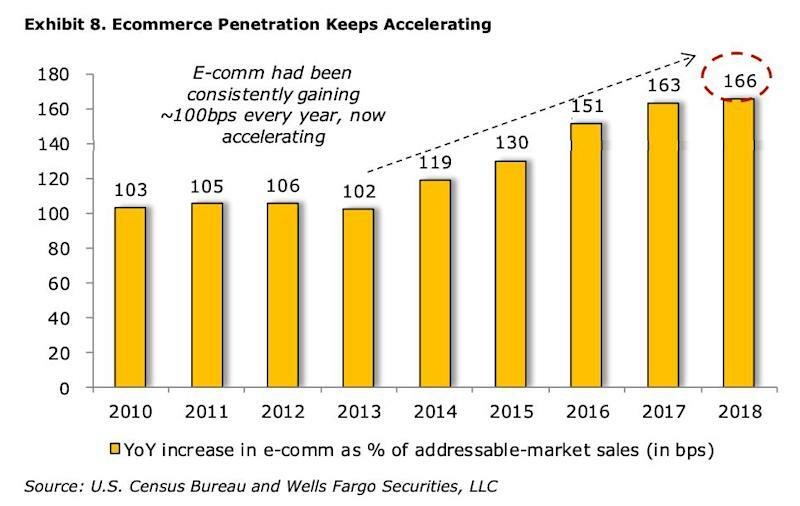 Ecommerce growth itself has been 1% each year since 2010 and is now accelerating. “Amazon is taking a larger share of growth than they have in the recent past,” they wrote. The biggest changes? Cosmetics, personal care, accessories, socks, underwear, shirts, shoes, and household products. The only big decreases? Auto parts, sporting goods, and books. Amazon’s runway for a future may still look vibrant as there appears to be untapped customers, but the analysts’ report pointed to some other areas that Amazon could improve to further dominate. Pain points for Prime members: people prefer bringing things back to a store; Amazon doesn’t have all the brands; physical stores still have convenience; unhelpful search results; pricing; and an unwieldy website.